While Kate has a love-hate, but mostly-hate relationship with eggs, I love them and a lot of my quick-fix dinner recipes revolve around them. I have such comforting memories from when I lived in Brazil and the locals would serve a late dinner of black beans and rice with a fried egg on top. It seemed like a strange combination to me at first, but since then I’ve come to absolutely love eggs with things other than the traditional breakfast combos. 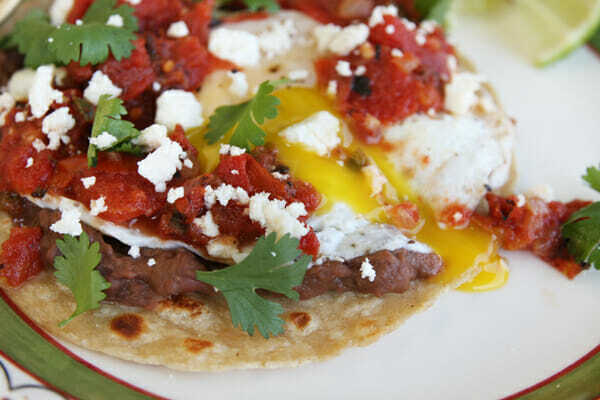 So this is my take (emphasizing the word my) on the classic Latin dish, Huevos Rancheros. I’ve purposely kept this recipe amazingly flavorful, while at the same time keeping the calorie count low. It’s a great light meal, whether you whip it up for breakfast, lunch, or dinner, and with a good mix of both protein and carbs, it’s quite filling as well. We’re going to start by mixing up a quick pan salsa. You’ll be amazed at how flavorful this is, with just a few simple ingredients. Finely mince some onion, jalapeno, and garlic. You want them minced small so they cook quickly. The jalapeno adds just a slight kick, but not too much heat. I’m a total wimp when it comes to spicy foods, so if I say it’s mild, I really mean it. If you’re concerned though, you could always substitute some mild canned green chillies, and wait to add them until the tomatoes go in. Saute the onions, jalapenos, and garlic in a drizzle of olive oil for a few minutes. If you’re using a stainless pan like me, all of those browned bits are a good thing, just keep stirring so the small pieces don’t burn. 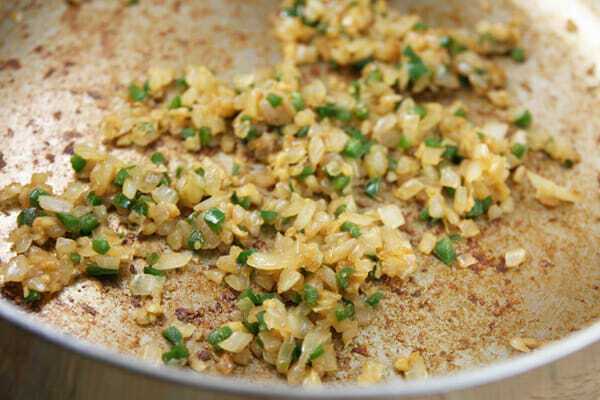 Stir in a little ground cumin, along with a sprinkle of salt and pepper, and then we’re going to use a great shortcut. 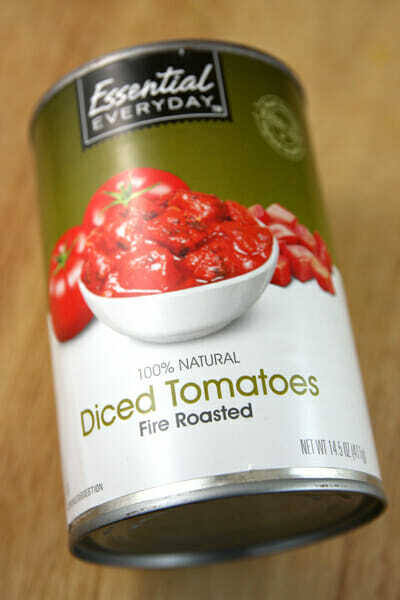 Canned, diced tomatoes are something I always have stocked in my pantry. For this recipe, use fire roasted ones if you can. They add awesome flavor and smokiness. Pour them in the pan, juices and all. Bring the mixture to a simmer and use a spatula or wooden spoon to scrape up those bits off the bottom of the pan. It just needs to simmer for about 5 minutes to let those flavors combine and finish softening the onions and jalapenos. 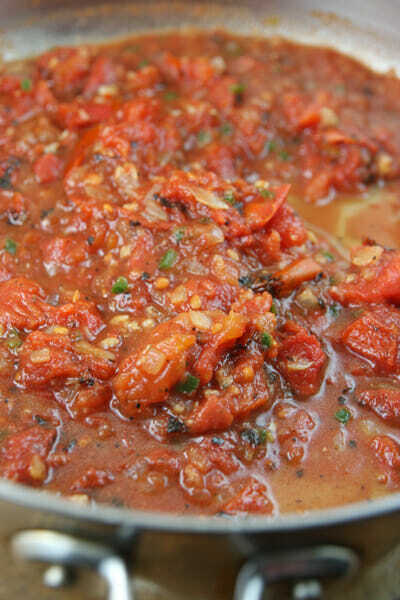 You get this amazingly flavorful salsa in less than 10 minutes. 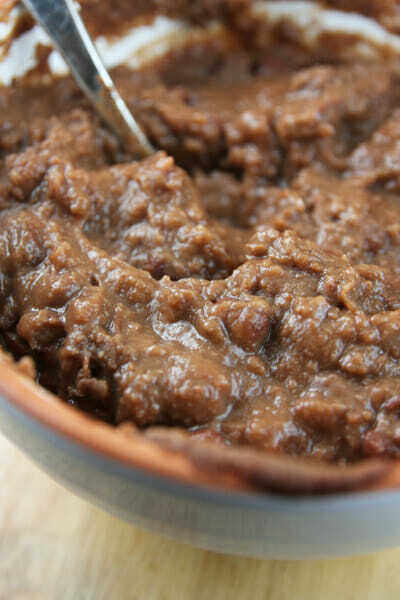 Set the salsa aside, and warm up a can of refried beans. You could make your own batch of our quick and easy black beans but we’re going for a super fast low-fuss meal here and canned refried beans actually work great. I use low-fat refried black beans. They already have seasonings in there so you just need to warm them up. I just pop them in a bowl and heat them in a microwave. Next up: tortillas. You can use any kind you like, homemade, flour, or corn. My favorite, which I’m pretty sure I’ve mentioned before, are these white corn tortillas from La Tortilla Factory. 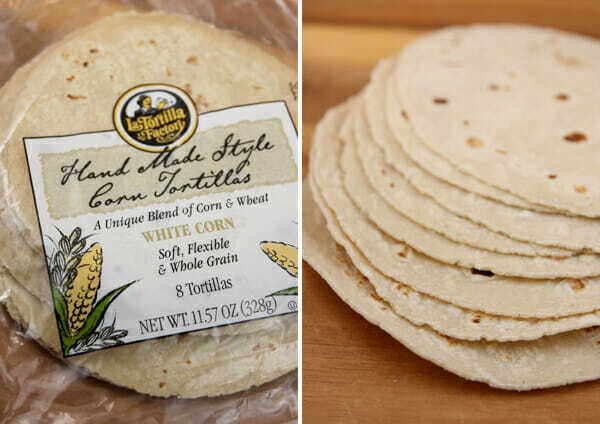 I love the flavor and body of good corn tortillas, but so often the regular brands at the grocery store are dry, crumbly, and bland. I haven’t found any that are like these- you get really great corn flavor, and a slightly chewy texture, but they’re still really soft and pliable. They taste like a corn/flour hybrid, because they are! Heat up a non-stick pan and once it’s hot spray a little nonstick spray in there. 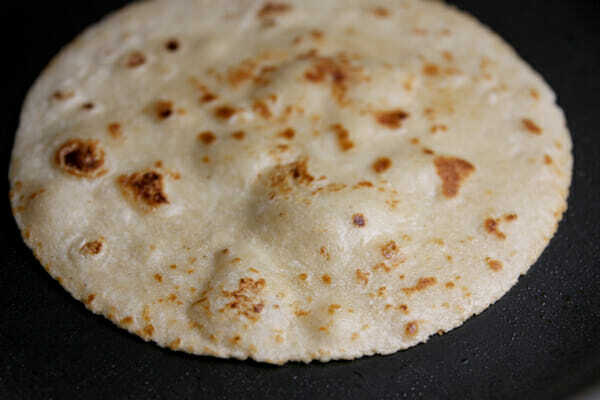 It just takes a minute to warm up the tortillas; cook them until you see little bubbles and they turn golden brown. Keep the cooked tortillas wrapped in foil, or in a warm oven to stay warm and soft. 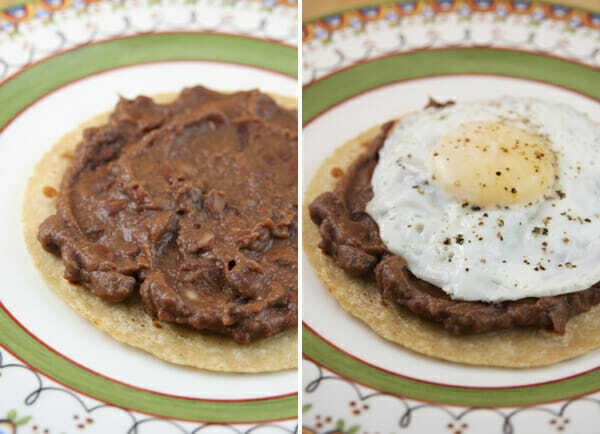 When you’re ready to assemble, just spread the beans on tortillas and top with an egg. You can fry the eggs, poach them, whatever your little heart desires. I usually just fry up a few eggs in the hot pan I warmed the tortillas in. If you’re making quite a few of these to serve, great trick is to spray or butter a muffin tin really well and crack an egg into each one. Bake them in the oven at 350 until they’re as done as you want them. That way they’re all done at the same time. After that, spoon the salsa mixture over the top and sprinkle with a little chopped cilantro and a little feta. You could certainly use any other type of cheese; pepper jack and cheddar are great, and traditional recipes usually use a Mexican cheese like cotija, but I actually don’t love cotija- I don’t think it has a lot of flavor and gets lost in this recipe. I use fat free feta because it’s really low-calorie, yet strongly flavored so you don’t need to use very much. You don’t need to try and wrap it up like a burrito, just eat it with a knife and fork. It makes a great dinner, or breakfast or lunch. and you can even have the salsa made ahead of time which makes it really easy to assemble last-minute. If you have an avocado around, it’s really good sliced up on there too. Heat a medium sized skillet to medium heat. When hot, add olive oil and then onion, garlic and jalapeno. Saute, stirring constantly for 4-5 minutes. Add cumin, salt and pepper and stir. Add tomatoes (including juices) and bring mixture to a simmer. Stir while simmering for about 5 minutes, using a spatula to scrape bottom of pan to release browned vegetables. Set salsa mixture aside. Heat a clean non-stick skillet and spray with non-stick spray. Heat tortillas one at a time until bubbly and golden brown. 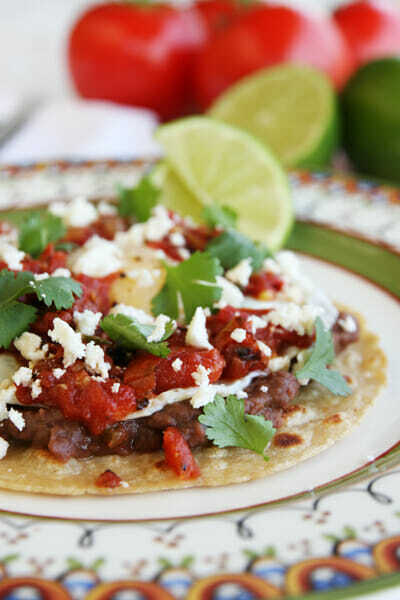 Spread about 1/4 cup beans on each tortilla and top with a fried egg. Spoon about 1/4 cup salsa over the top and sprinkle with cilantro and feta. Serve with lime wedges if desired. Serves 6. Will you be coming back to Utah anytime soon? I missed you at Orson Gygi 🙁 Just curious. They are coming in October to Logan! Yeah! It’s the weekend of tofw, Oct 12-13. Yea! I’m so excited! thanks for getting back to me! Feta? Tsk, tsk. 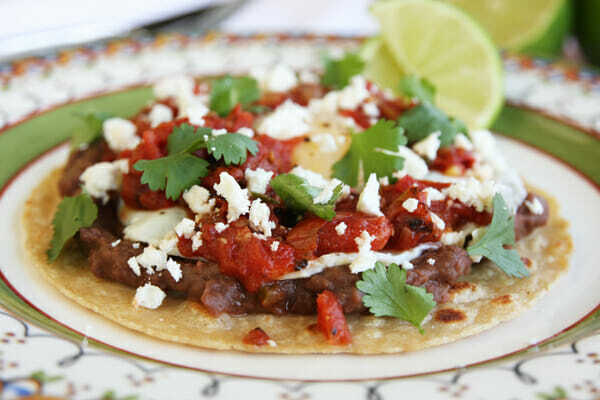 Huevos Rancheros require queso fresco or cotija. I mentioned in the recipe that this is *my* take on the traditional dish. I’m not a huge fan of queso fresco or cotija and I love that feta gives the same look and similar texture, but with more flavor. As I mentioned in the post, you can feel free to use whatever cheese you like! Are you coming to the Boise Costco? or just the Deseret Book? And do I need to buy my book there, or can I get it elsewhere and bring it with me? Thanks! I’m not going to be doing Costco, just Deseret Book. You can buy it anywhere and come on in with it- no problem! Your tip about baking the eggs in muffin tins just made me remember that I have a muffin top pan. I don’t like the way muffin tops bake in it but it would be perfect to make flatter round eggs for this recipe! So, now where do you get those tortillas? I hate all of the dry ones sold in most supermarkets. I just find them at my grocery stores, stocked with the other tortilla brands- take a peek next time you’re at the store! Funny story. Try finding a tortilla in the entire state of Maine. The man in the grocery store finally figured out what I was looking for and referred to it as “roll-up bread”. Haha, yes! That’s why I love them so much! Okay that looks SO good right now _ I am starving and I could dig into those pictures right now! Yummy – thanks for this recipe!!! My family will love these! Thanks for another great recipe! I am so making this for dinner tonight. Thank you thank you for a fun option to pull me out of my cooking rut. 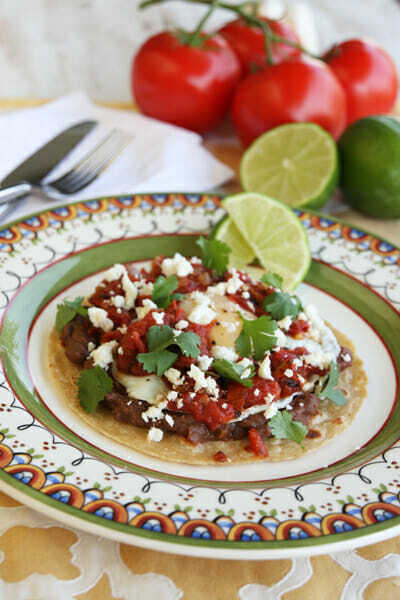 We love huevos-rancheros as a special brunch. We like to scramble our eggs, we do add fresh sliced avocado, cook bacon (no nitrates) crumbled, sprinkled Weight Watchers Mexican Low Fat cheese (shredded). Ours is not as low calorie as your healthy version but it is a brunch. We usually serve this with fresh fruit i.e., strawberries. Just have to say I LOVE BOTH your cookbooks and you guys were great at the Denver TOFW!!! I was sad I missed you at the end. I wanted you to sign my book. WAAAAA! But that is what I get for waiting… 🙂 I bet it’s nice to be home! Oh, I’m sorry we missed you! We almost never leave early, but I had to jet out to catch a flight and Kate had to go take care of her sweet little baby. Boo! Your fried eggs are so pretty! Mine never look that good. I would like that how to post. Perfect timing, thank you for planning my dinner tonight! I hope it works with bottled salsa anise I am short on the ingredients for yours. Love your blog and cookbook…looking forward to buying the new one! Would love to come to a signing but I’m all the way in Michigan! Congrats on your book success! And these eggs are exactly how I like t eat them…yum!! I got your cookbook this weekend and my girl crush on the two of you is cemented in yumminess. My boyfriend can’t wait until I start making some of your recipes, he has kindly sticky tagged (almost) every recipe in your book marking the ones of upmost urgency in brigh pink! Thank you both so much for providing this wonderful site and for now publishing your cookbooks!!!! I can’t wait to try this, though I may have to tone it down a bit for my kids. It was great to see you guys at TOFW you are amazing and inspiring! I’m still laughing at my husbands stink eye when I told him I was going to buy your latest book. Oh well, I will have to be patient until Christmas. From a born and raised New Mexican the only REAL way to eat huevos rancheros is to smother them with loads of hot, fresh roasted green chile and cheese. Mmmm… But these do look very delicious and fresh for sure. I will be trying them. Those tortillas look awesome. I’ll have to look for them at all my various grocery stores to see if anyone carries them. And the recipe looks way better than the scrambled eggs with salsa that my dad calls huevos rancheros! I wish I could come to the book signing on Friday night but I am a nurse and I have to work. 🙁 Would be a pleasure to meet you! This recipe looks amazing. I am super excited about the trying the White Corn Tortillas. I am going to make it for dinner tonight. Why can’t I see the print recipe button? Did it move? I guess I will have to go old fashion and write it down. Thanks for another yummy, easy, dinner dish! We read every comment! You’re so sweet Jaime, thanks so much for coming to TOFW! Just made this for my lunch….so yummy! I made the breadsticks from your first cookbook last night and can’t wait to buy your new book this weekend! I LOVE huevos rancheros. My favorite twist on them is ALWAYS done the morning after we do a pork shoulder in the crock pot. I use the leftover pork and mix it in with some green enchilada sauce to do a cheater’s chili verde. Otherwise, Everything else is the same as this one, minus the pan salsa. Yum! Looks so yummy! I am a Texas girls, so I love some spice! One of my friends and co-bloggers frequents this recipe. She recently featured it on our blog in a Mother’s Day recipe round-up. Drop in to see : http://thirty-one10.com/entertaining/mothers-day-brunch-recipe-round-up/ Thanks for sharing your recipe with cannot-really-cook-so-need-a-recipe people like me! I love it sooo much. Thanks for all the great recipes. Yum! I need to try these. I make a lazy version with scrambled eggs (cooked with a sprinkling of the spices from your spicy honey chicken recipe), La Costena’s black beans (whole, but in an amazing sauce), and whatever salsa or tomatoes I have around. I could eat this every day, but will have to try it with the refried beans and tortilla for dinner. I find using a microplane for the garlic is the best. ❮ Previous Post Previous post: It’s Heeeere!